I had a weekend off Malifaux events this weekend and through family commitments didn't get any hobby time in. So it's back to musings around models and play. I've been thinking a bit this week about set plays so I thought I'd ramble on about those for a few paragraphs. Use the scrap counter to make Steam Arachnids. This is the most soulstone and AP efficient way to get scrap on the table to summon spiders with in the first turn with a Ramos crew. No AP or activations wasted, minimal crew involvement necessary. There are more involved variations that net you more scrap. Recently I saw an interesting counter to this play from Jon Mickleburgh; before Ramos reached step four he had a Void Wretch bury Taelor (or another threat). That way if Ramos executed step four he effectively drops an unactivated combat monster on top of his head. These plays aren't uncommon in Malifaux. A lot of models have simple combinations with others to provide a powerful synergy or neat trick. One thing that's important though is never to stop experimenting and asking yourself; is the set play the right play now? Clearly in the above counter makes completing the Ramos set play a mistake, or at very least not an automatic call. I can't tell you how many VPs I've seen players lose by completing a set play that was demonstrably the wrong thing to do in the situation, just through habit and inertia. So next time you reach for your favorite set play think, what else can I do? 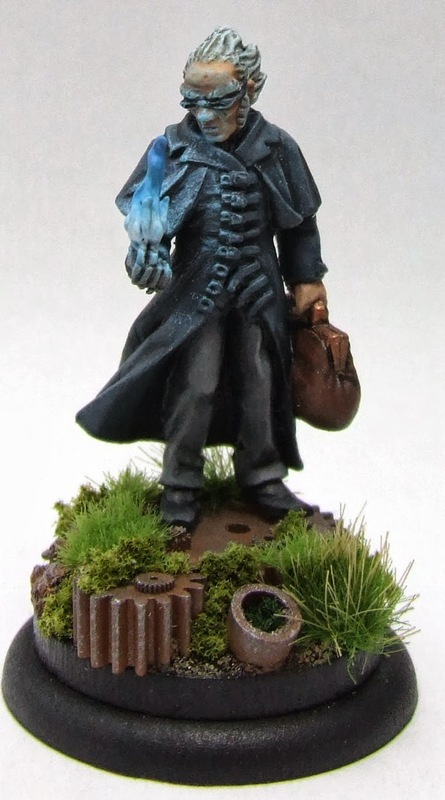 You may surprise yourself, or at the very least not get welcomed to Malifaux with a big hammer. This is also where practice and experimentation come in. Try all the upgrades for your master, don't take the same crew every game. Especially when you're playing friendly games. It's easy to get trapped into the mentality that you want to keep playing the same crew just because it works, but it's always good to explore. You never know what you'll find. In this vein I've lined up some new models to try out in my Arcanist lists over the coming weeks. Including a mercenary I'm very interested to try. That's it for the main body of the post. I just wanted to drop in a quick plug for an event I'm running; the UK Team GT, on the 5th and 6th of April 2014 in Stockport. This promises to be a fun event for teams of three (or trios I press gang together) and something a bit different to the normal singles events. Hope to see you there. Meanwhile happy hunting! Halifaux - Game over man! Some of the best trophies I've ever seen. I'm not really sure why no one has held a Malifaux tournament in Halifax before, the names are so similar it's practically halfway through the breach already. So this Sunday that sorry state of affairs was rectified by local henchman Mike3838, who ran; Halifaux. After three rounds of fun play Joel Henry bested the other twenty-one of us and added another win to his record. I played like a noob most of the day and came in fifth, which I'm comfortable with. I learned a lot and have tons more to mull over between now and my next event in two weeks time. As I talked about in my previous post in most events you need to win big. This was the case on the day. I ended the event 2-1 and on a +7VPD. The size of my VPD put me top of the six players on 6TP, hence I finish 5th and not 10th. This sort of difference matters in the rankings points marathon the top UK players are running in. Spurred on by something in my second round at Halifaux I want to talk about ending rounds and timing in competitive play. This travesty aside it did get me thinking about event timing and when and how to end a round. Before I start I want to be clear that I'm not criticizing any tournament organizers here, there is no right answer, someone will always win or lose by whatever margin you allow. I just want to talk options and general approach. I've seen many players complain, and even get angry about exactly when a game ends. Another turn more or less and I would have won, another activation... Thanks to variable game length this even happens when there is no time limit, the dreaded 10+ for a turn six. In tournaments however there is a time limit, for practical reasons if nothing else. Clear Timings - Our perception of time changes depending on what we're doing, this is very true in tournament situations. TOs need to be very clear with their players about how long remains in the round. Warnings after a quarter, half, and three quarters time elapsed are really important, but often overlooked. There should also be warnings as players approach any deadlines. Full Turns - Generally it's better to play a complete turn than a part turn. It leaves players feeling less hard done by than if the game ends between crucial activations. It isn't always practical to let players play a complete final turn though. I remember having a venue packed up around me and Craig at a doubles event once. It think what's key here is calling final turn with long enough for players to play a full final turn, probably around the twenty minutes remaining mark. This will minimize the need to have games end between activations. Player Honesty - In my experience players will often try and sneak in an extra turn after last turn has been called, or continue playing after last activation is called to try and complete the turn. Whatever the rule is I think it should be respected by the players and enforced by the TO. As someone always loses out. Practice - Players should play more timed games at their local clubs, even if only intermittently. Just so they can get the hang of how long they'll have, and how to think quickly. This will help the avoid falling down due to time limits. Penalties - It is up to players to get through their games in the time limit allocated to them. It's worth considering applying an automatic penalty to players who haven't completed their last turn (be that turn one or turn six) and handed in their score by the end of the time limit. That way players are actively encouraged not to start turns they cannot finish, and to get through their turns. Now this last option should only be applied once the other four are in place, or at least the first two. So those are my musings on calling time at events. As always I'm keen to hear thoughts from people; here, by PM on the Wyrd boards or on Twitter. I also wanted to say well done to Adam Boyes for winning the painting on the day with his amazing crew. Adam is truly a miniature painting artist. Check out the gallery of his work here; miniature-painting-tuition.co.uk. *To be clear, yes I'm joking, I deserved to lose the game the timing had little to do with it. Photos in this post were looted from Mike3838's twitter feed. This weekend was the Malifolk tournament down in Norwich so me and tournament travel buddy Ant Hoult rented a car and headed south through torrential rain and dire warnings about the risks of not paying for overpriced excess protection. After four hours on the road we landed at the obligatory travelodge with obligatory frightening night desk guy. Tonight's special guest had this uncanny valley joy about him, like he was feigning human emotion until it was time to kill again. Fortunately the hotel room was comfortable and with all the spare furniture stacked against the door I got something resembling sleep. 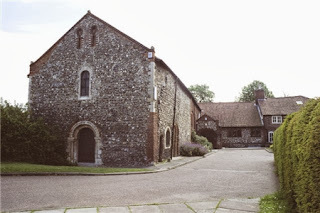 Next morning we arrived at the venue to discover the place was a quaint old stone building, which turns out to have been an nine-hundred year old leper hospital. Surely good news for the Resurrectionists among us. Inside the Malifools and other regulars who'd made the trip were gathering and we got caught up ahead of a frantic days Malifaux. The day was fixed master, so I'd opted for my main man Ramos. I actually wound up using the same models in my lists all day with slightly different upgrades and soulstone pools; Ramos, Electric Creation, Joss, Miss Step, Johan, and two Molemen. Johan has replaced the second Rail Worker in my routinely used pool of models. The power of Rebel Yell to remove conditions, on both friendly and enemy models with ease is too strong to overlook. Plus he's no slouch in melee and can ruin Flesh Constructs, which seem to be heavy in the meta right now. 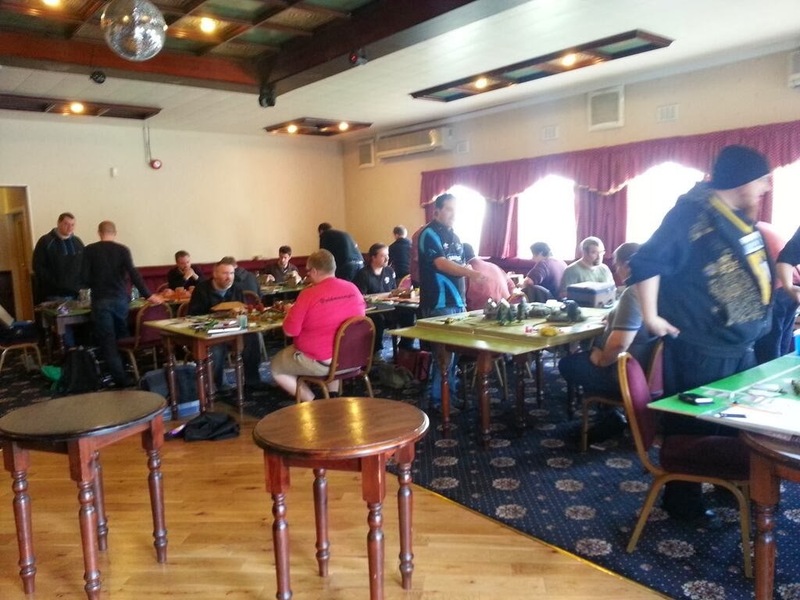 Twenty-two players arrived for the event, large one day events are always a logistical challenge. Do you go for three or four rounds? Three gives you enough time to comfortably time the games, four leaves you pushed for time but leads to a cleaner result on games. The winner is usually on TP at four rounds and VPD at three. Lee, who was TO'ing the day had opted for four rounds which meant we were going to be moving through games at a fair old pace. For the record there's no right answer here, it's a difficult balance. I originally typed a rundown of my games here, but when I read it back it was very long and very boring, so I've edited it out. I'm going to talk about something else instead. One of the Bendyboards used at the event. At the end of the second round I was on two wins, putting me in the top bracket on points. However my VPD, the difference between mine and my opponents victory points totaled, was the minimum possible for a player with two wins; +2. at the very lease would be playing at the lower end of the players with two wins. If I lost the best I could hope for is fourth place. If I drew the game I was on track to end the event on the podium in second or third. If I won big I was on track to win or podium the event. If I win small I can only come first or finish fourth place or lower, second and third are out of bounds. I played the game to the best of my ability and came up with a small win 5-3, giving me +2 VPD and taking me to +4 VPD total. Which meant going into the final round it was all or nothing, I could either win or come fourth (at best). This led me to a conclusion, I need to work out how to 'win big' in Malifaux. As things stand my win rate is sufficient and I'm happy with that, however I'm only winning an average of two points a game. Which is fine at events where you can reach the top of the pile by winning games alone, but in most events you need a good VPD to get to the top. So I'm going to dedicate some hobby time over the coming weeks to understand how I can 'win big' in games. Which I appreciate is a nice problem to have. I think this will be connected to being more aggressive and changing my builds to focus more on scheme marker removal. At any rate I managed to score a 7-4 win in the final round, in a riot of a game against Malifool Mike Marshall's McMourning crew, try saying that after a few drinks. This gave me the full four wins and was enough to put me in first place and net me a shiny new bendy board to take north with me. Ant made it into second place with three wins and a draw, followed by UK number one ranked player Joel Henry in third. I had a fun day, everyone was welcoming and all my opponents were great people. Big thanks to Lee for running the event, everything went smoothly. Plus there was free tea all day, a privileged a may have abused. 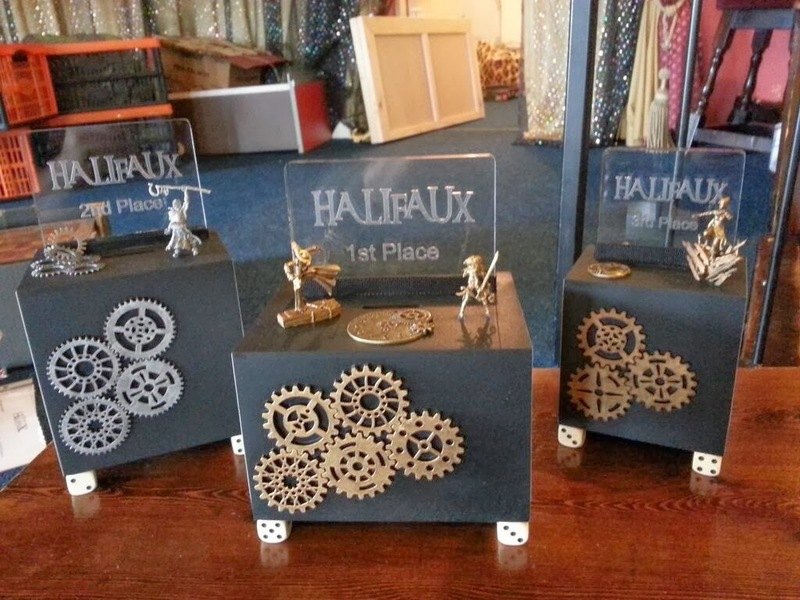 I have another tournament, Halifaux, on Sunday this week and more in the pipeline after that so it's shaping up to be an interesting start to second edition. I thought I'd have a change of pace, and as I've had a lot of positive comments about my basing recently I thought I'd post a quick step by step on how I base my minis. As many hobbyists will tell you basing is key to good looking minis. This is because we spend most of our time looking down at minis from an angle, which makes the base is a big part of what we see. Meaning any level of paint job can be elevated (or detracted from) by the way the model is based. When I base my minis I like to add some height to them. Adding height to a model makes it look more imposing on the tabletop. Height also translates to depth as you're looking down so it make the whole model look more three dimensional than it would if it were mounded on a flat base. I'm using these 'upper' bases for a couple of reasons beyond the aforementioned height. Firstly the MDF makes it easy to pin the miniature to the base, something that I find vital in gaming. It also effectively doubles the thickness of the base making the whole piece easier to handle and reducing the need to handle the mini itself. I use 3mm thick MDF bases with diameters of; 25, 30 and 40mm which fit on top of the plastic; 30, 40 and 50mm bases respectively. You can buy these from various places, including Sarrisa in the UK. I'm now going to go step by step through basing a mini, I'll be using the 'overgrown scrapyard' version of my technique I've used on my; Hoffman, Ramos and Mei Feng crews. There are photos of some other variations on this them at the end of the article. I cut a rough section of tile and glue it to the base (laminated side down) along with some bit's of plastic cog and strip styrene. The objective here is to get the core structure of the base in place to make sure everything fits. The cork provides some basic terrain, very little ground is really flat. You can layer the cork if you need more height. 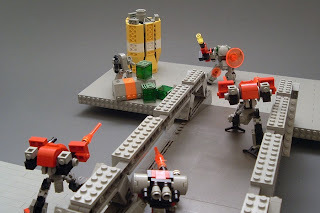 There are a lot of places to buy plastic cogs, I get mine from Technobots. Strip Styrene or Plastruct is available from most model railway stores, this is designed for model making and is great for representing girders and pipes. I use superglue for all the gluing on my bases, which speeds up the process no end. Don't worry too much about any parts that don't look good, you can cover these later. It's also important not to over think the placement of the parts. As long as the mini will fit on the base it's probably going to be fine. With this done we're now ready to start painting. I start with a good coat of Army Painter Leather Brown spray. This is good for a base coat and I like the fact you can get exactly the same shade in a brush on paint, which makes correcting later mistakes much easier. 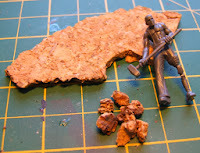 Next I dry brush the cork section heavily with Vallejo Cold Grey and then lighter with Stonewall Grey. Then the metal parts are stippled and dry brushed with a dark metal, in my case Vallejo Gunmetal Metal. 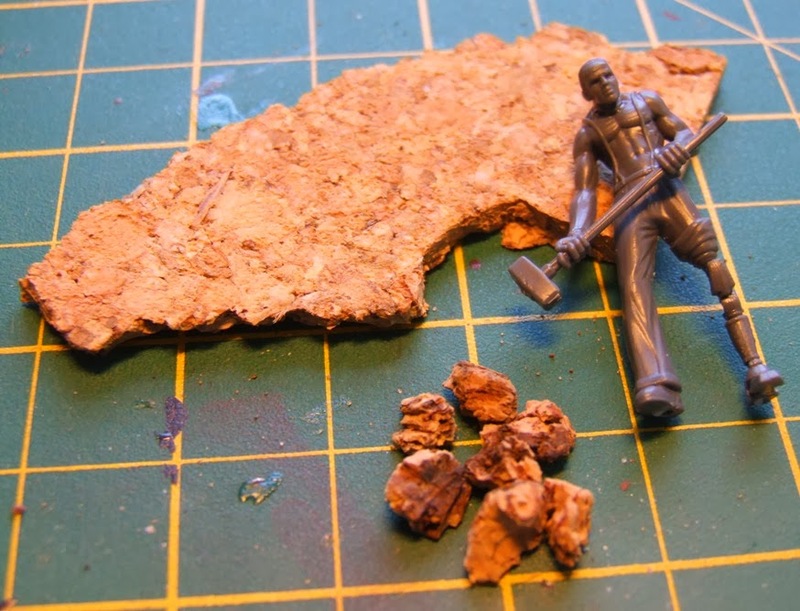 The idea here is to make metal show on exposed edges and in random patches on flat surfaces, like dirt has been partly warn away to reveal the metal underneath. Now it's time to add the plant life. One of the key things when using any scatter on a model it to use multiple types. The more types you use the more natural the base will look. I use four kinds; Small chunks of Woodland Scenics light and dark green clump foliage and miniNature (Silflor) grass tufts; spring and two colour summer. I use more of the light that the dark in both cases. Grass tufts are very much the 'in thing' in basing right now, and they really are amazingly easy to use. Just grab a few from the packet and glue them into place. My tip is to use more than one variety and also try to mix the lengths. The temptation is always to go for big long ones, but mixing it up and using very short ones to very the effect helps make things look more natural. Scatter the plant life as much as you can around the base and aim to almost overlap the different kinds so they look like they're growing into each other. I also use the foliage to cover and parts of the base that don't look as good, which is great for covering mistakes made earlier in the process. You can also 'creep' the clump up and over raised cogs pipes and girders, Do this by gluing little chunks in a irregular lines up the surface. Always avoid using large chunks of clump foliage, about 3mm cubed at the very maximum. Lots of small bits of clump are better than one big one. I tend to use a few blobs of green stuff backed up with super glue to attach the bases together. I was at my local club the other night chatting with an old high-school buddy of mine. He's more of a role player than a wargamer, but back in the day (almost twenty years ago) he introduced me to the hobby. We were chatting about gaming and he was looking for a skirmish game to play between RPG sessions. Malifaux is a lot like Lego. I don't just mean they're both made out of plastic, although that's true. What I'm talking about is the way you collect Malifaux is a lot like how you collect Lego. You start out by buying a kit which comes with all the bricks you need to build a complete helicopter, or whatever. You can then play with the helicopter all you want. Few kids however stop there, sooner or later they buy a kit that makes a car. Then they start mixing the parts from those kits together to make a heli-car and the whole thing spirals from there. Malifaux is sort of the same. You buy a McMourning crew. You find Canine Remains work well in there so you buy those, then you add a Rogue necromancy to the list. You discover those are beasts and before you know it you're also collecting a Marcus crew. 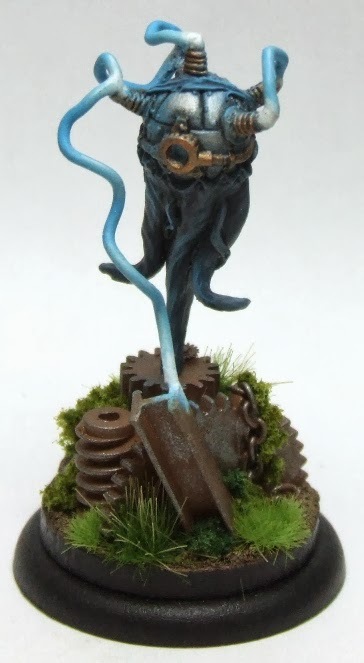 This is without a doubt one of the key charms of Malifaux for me. It lets you get into the game cheap, this is nowhere near as expensive to get into as most other games. The constant avenues for expansion however mean there's no end to the collection potential. You never run out of places to expand to. 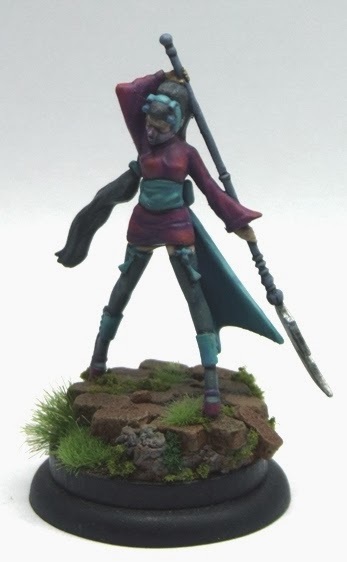 This is also good commercially for Wyrd, keeping players expanding their collections is a good source of revenue and the overlap of models between masters and factions means they don't need to have as many lines in the range. One of the the clever things about M2e is the way an existing master from each faction has moved to moonlight in another faction. This opens up new models to existing players without broadening the range further. Which again allows Wyrd to generate sales to existing customers while moving the range over to plastic and hopefully encouraging more new players into the game. So in summary, Malifaux is a very modular system you can get into cheaply and expand at your own pace. Not really sure what the point of this post was but there you go. 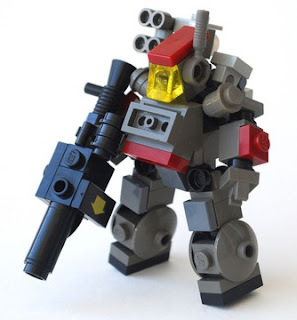 Oh and these lovely Lego mechs are from a game called Mobile Frame Zero: Rapid Attack, which I've never played but looks pretty sweet. Adrenaline - fight or flight? This weekend was the first second edition Malifaux event to be held in the UK. A quick three round one day tournament at the North West Gaming Centre in Stockport. It was billed as a small release event and in the end nine of us arrived to do battle. The atmosphere was relaxed with everyone just looking to play a few games and get up to speed on the new edition. In fact a good number of the players arrived with less than three games of second ed to their name and some were sporting no play time at all. So as one of the few in the room with any real knowledge of the game it fell to me to give an impromptu brain dump of all the changes between editions. Brain dump over, and with an odd number of players I offered to take the bye in round one so I could answer rules questions and generally smooth the culture shock. This was good henching practice and I think I got most of the rules right. Lunch followed and then we were into round two, my first round of actual play. 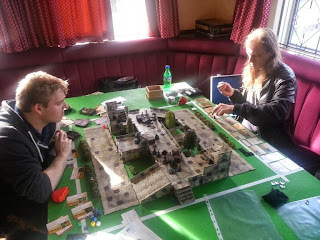 I got to take on new player Richard with a Viks crew he'd borrowed for the event. The game was good fun and almost bloodless as I took out Taelor and a Desperate Mercenary early while Ramos fed the hired swords a few spiders in return without either of our main forces truly engaging. The game ended a slim 9-8 win to me. My final round is the one I want to talk about. I played veteran Aidan Kirk. I first met him about two years ago at a Malifaux tournament, also at NWGC, and he's a thoroughly nice bloke. 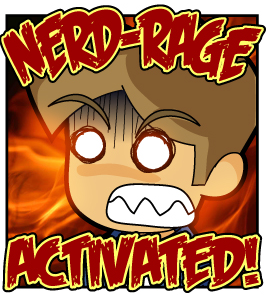 I say this as inoculation against the fact he's a Lilith player. Boooo! 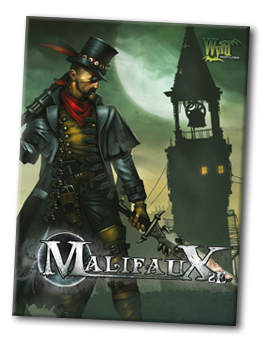 In most games of Malifaux it will advantage one player to force combat and the other to avoid it. Understanding if you want to be attacking or avoiding* in a given situation is vital to winning the game. I've seen so many players lose games by making the wrong attack / avoid choices. Most players are biased and will default to one rout or the other. You need to be prepared to play both games well and at the right time to win. A player who is likely to win in combat or who is behind on VPs will want to attack. A player who is likely to lose in combat or who is ahead on VPs will want to avoid. The situation is rarely as straightforward as above though. You may need to attack in one place and avoid in another. You may need two turns of combat to gain an objective but know you'll lose it on the third. So attacking on turn four makes sense but attacking on turn three doesn't, therefore you'll play avoidance until turn three then switch to attacking on turn four. The attack / avoid choice is often subtle, but always important. Which takes me to this game. We were playing Reckoning with a scheme pool of; Assassinate, Break Through, Murder Protege and Plant Explosives. I took; Mei Feng (Seismic Claws, Vapormancy, Imbued Protection, cache 6), Kang (Imbued Protection), Miss Step, Johan, a Rail Worker, and two Molemen. 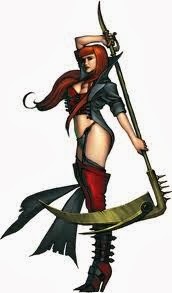 Aidan had; Lilith (Living Blade, Wicked Mistress, Fears Given Form, cache 6), Barbaros, Candy, Teddy, a Doppelganger, and a Beckoner. 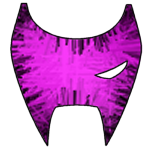 I announced Breakthrough and Murder Protege, he announced Murder Protege and I figured his unannounced would probably be Assassinate. So here's my question: Should I have attacked or avoided, and why? I think my decision contributed significantly to me winning the game. You can post your thoughts below, PM me on the Wyrd Boards, tweet me @mythicFOX83, or email me james <at> mythicfox <dot> com. I look forward to hearing from you. I'll post what I actually did in a week or so. As I mentioned this game did end in a win for me, putting me at two wins an a solid VPD for the event (with my bye factored in). I was please to have this land me second place behind team mate Craig 'ukrocky' Johnson. I also picked up best painted for my Mei Feng led Arcanists, which I'm very pleased with. Afterwards I hung out and chatted with people. It was nice to see new faces who are very enthusiastic about the game. 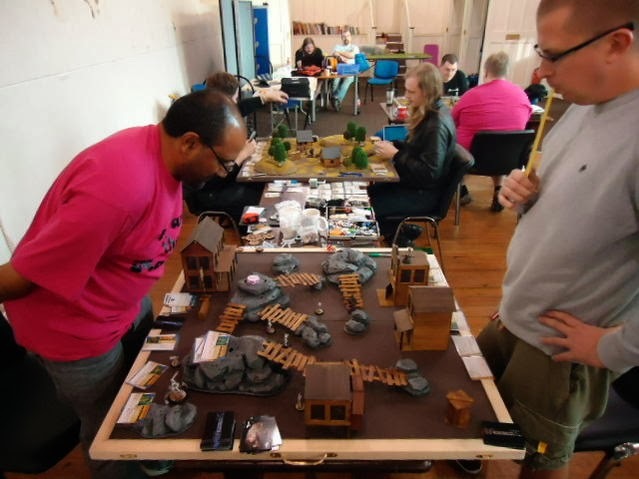 One player had even been sent by his wider play group to scout out how friendly Malifaux tournament players were to each other. I think we sent him back convinced that we're all friendly and welcoming people, which has always been my experience at Malifaux events. So all round a good day. Roll on Malifolk! *As a foot note, I use the term 'avoid' rather than 'defend' as we're really talking about encouraging or discouraging combat between crews, as opposed to resisting the enemies attacks as defending would imply.